(Nanowerk News) Mussels stick to rocks on the seafloor, to aquatic plants, and — to the consternation of boaters — they can hitch rides fastened to seafaring vessels no matter their composition: metals, rubber, glass, wood and more. But today's bothersome bivalves may help researchers to develop a new means to mend a wound. Scientists at the McKelvey School of Engineering at Washington University in St. Louis have replicated the mussel's sticky protein and are now working to improve it for everyday use. The strong, underwater adhesive could have many applications, it could even help to fix the very boats now vexed by the mollusks. 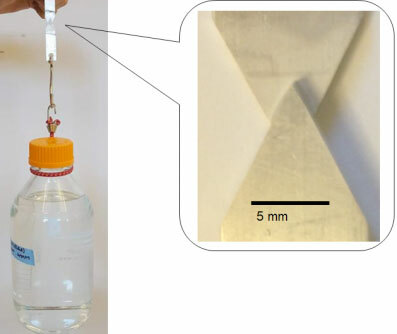 "Most synthetic glues do not work on wet surfaces, but mussel foot proteins (Mfp) can adhere to surfaces even underwater," said Fuzhong Zhang, associate professor of energy, environmental & chemical engineering. "This unique property makes Mfp suitable for many applications, from underwater repair to biomedical glues. With further engineering, an Mfp glue could be used to heal wounds, or maybe even to replace sutures." Zhang has received a $502,034 grant from the Office of Naval Research to improve on their initial success, microbially produced underwater adhesives that are stronger than those created naturally by mussels. Research in the Zhang lab focus on engineering microbes to produce renewable materials and chemicals with desired properties, a field called synthetic biology. An example of his team’s work includes engineering bacteria that produced synthetic spider silk as strong and tough as natural spider silk fibers. For adhesive proteins, in research published in late 2018 (ACS Applied Materials & Interfaces, "Microbially Synthesized Repeats of Mussel Foot Protein Display Enhanced Underwater Adhesion"), his team demonstrated that synthetic proteins made by engineered bacteria can be even more adhesive than natural Mfps when used underwater. The power of synthetic biology is that researchers can fine tune the property of protein materials by manipulating their genetic codes. “We can change one parameter each time,” Zhang said. For instance, the length of a chain of Mfp5. “If with an increase of one parameter, we see adhesion becomes better and better, then we can say, ‘OK, this parameter is able to increase adhesion,'” he said. It turns out, that is exactly what the team has found: when the MFP protein chain was made longer, its underwater adhesion was stronger than that with natural chain length. This approach could allow them to explore many unknown mechanisms that control underwater adhesion, parameter-by-parameter. "Understanding the mechanism by synthesis has the potential to lead to additional enhancements in adhesion, or improve other glue properties.” Zhang said. “In general, we’re trying to understand the mechanism using synthetic biology by producing and testing the materials."